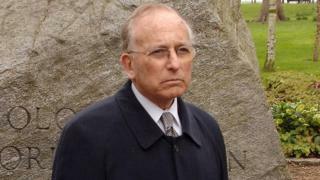 Twelve former residents of children's homes say they were abused by Lord Janner, a BBC investigation has found, as criminal proceedings end. The peer, who died before a court could examine claims of child abuse against him, regularly visited homes in Leicester in the 1970s and 1980s. An ex-police officer says he reported suspicions about Lord Janner, a decade before police began a full inquiry. Lord Janner, who had dementia and died aged 87 in December, had denied abuse. A "trial of the facts", due to take place in April, has now been shelved by prosecutors. A jury would have been asked to decide - without reaching a decision about whether he was guilty - if 22 alleged incidents of abuse from the 1960s to the 1980s had taken place. Lord Janner's family have said he is "entirely innocent" and a man of "great integrity and high repute". However, the BBC has traced and interviewed dozens of men and women who lived at children's homes in Leicestershire in the 70s and 80s. It has also spoken to council officials, social workers, police officers and journalists involved in investigating the case of Frank Beck, a notorious care home manager who was eventually convicted of child abuse. Media captionAlleged victim Mark: "He would help us undress... it was touchy feely"
One man, Mark, who has never spoken about his experiences publicly before, said Lord Janner, a member of the Magic Circle, would undress him, wash him and touch him intimately, during visits to the Moel Llys children's home to perform magic shows. Mark said he was 11 or 12 at the time. "It's mentally scarred me for life," he told the BBC. "I can never get rid of it. You feel ashamed and you feel dirty. Useless and worthless." Five alleged they were abused at the same Leicester primary school when Greville Janner visited. The allegations range from groping to the most serious forms of child sexual abuse. Frank Beck was a Liberal Democrat councillor and an influential social worker. He abused children under the cover of a childcare technique he advocated called regression therapy, which involved treating teenagers as if they were babies, but also beating and suffocating them. Beck also picked out children for sexual abuse. He was sent to prison in 1991, where he died in 1994. During Beck's trial, he and an alleged victim both sensationally claimed that Lord Janner was a child abuser, and the alleged victim was then interviewed by police. Lord Janner told the House of Commons in 1991 that this man's allegations against him were "disgraceful, contemptible and totally untrue". But senior figures at the Crown Prosecution Service are now understood to regard the case against Lord Janner as "overwhelming" - and the level of abuse alleged as "horrific". A former detective, Graeme Peene, told the BBC that in the late 1970s he reported Beck, after seeing him rubbing a boy's groin at The Beeches children's home. He was later asked to go back to The Beeches to return another boy who had run away, and was directed to Beck's office. He said that Lord Janner - who he referred to by his first name, Greville - was sitting in an armchair "and next to Greville Janner was this young boy". Mr Peene added: "I thought - that's a bit strange. What's an MP doing there, and what's a young boy doing sitting on the arm of his chair?" "[Lord Janner] left the office with his arm draped over the boy's shoulder." "I'd got my suspicions about Frank Beck, but [there is] also the fact that an MP is there and he is being too tactile with a young boy who is obviously in the care of the local authority." Mr Peene says he considered it "an unusual occurrence" which was "something I felt ought to be reported". He claimed his report was sent to divisional headquarters where, he said, nothing was done because of a culture in which child abuse was not taken seriously. The BBC investigation received an account by another detective that he had reported allegations against Beck, Lord Janner and other prominent Leicester figures, but his bosses "did not want to touch it". Eight former residents and staff from the children's homes told the BBC they remembered Lord Janner often visiting Beck - especially at The Beeches home. John Milligan, who worked there in the mid-80s, said he was introduced to Lord Janner by name, and claimed the MP was such a regular visitor to Frank Beck that he assumed they were having weekly meetings. A female former resident said "he just used to be with Frank all the time walking around". She recognised him later from his picture in newspapers and leaflets. And Pat Varnam, who was in the Ratcliffe Road children's home, said she often saw five or six men "waltzing round with Beck" and while she could not identify them, others in the home believed Beck and Lord Janner were friends. It is possible that Lord Janner's visits to see Beck were professional in nature. However, a former official at Leicestershire County Council, who asked not to be identified, told the BBC that when he twice raised concerns about Beck's methods, the care home manager used the Labour peer to justify his actions. "Beck used Janner's name to achieve whatever Beck wanted to achieve," he said.